There’s often confusion around the need for a Buyer’s Agent when buying new construction in Columbus. After all, home builders usually have sales agents on-site who are friendly and ready to help. It seems easy at first. You get to customize a brand new home exactly how you want it, without worrying about issues from previous owners. However, buying new construction in Central Ohio is not as simple, or problem-free, as many people think it is. Moving forward in a new home purchase without someone working exclusively for you could cost you. There’s a lot that can go wrong, and you may end up with a home that isn’t as perfect as you hoped. 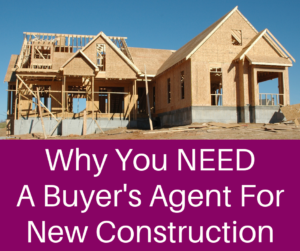 The answer to whether or not you need a Buyer’s Agent to purchase new construction in Columbus is – Absolutely! Truthfully, you need a Buyer’s Agent who will work for YOU. An experienced agent working for you will look out for your best interests. As with any Columbus home purchase, there are pitfalls, risks, and complications that can arise during the purchase and building of a new home. It’s important to start the process with a Buyer’s Agent in your corner, because your agent can provide guidance at every step. Your experience and the quality of your newly built home can depend on the builder. One of the top reasons to use a Buyer’s Agent is to help you find a reputable builder. A great Realtor will have a network of industry professionals. If a builder is not taking care of their customers, word spreads around the real estate industry. A lot can go wrong with new construction. From labor shortages to weather, there are many issues that could arise during your home’s construction. Some Central Ohio builders have a fantastic reputation for delivering homes on time, while others have the opposite. In fact, construction delays make up a large number of complaints about new construction. Buying and selling a home at the same time can be stressful. If you’re new home isn’t completed on time, it will only make the process more difficult. On the flip side, I’ve read numerous complaints about builders’ shoddy work. They may have completed the home on time, but they compromised quality craftsmanship. Low quality work or mistakes on your new home could lead to problems many years down the road, when it’s too late to get the builder to make it right. Real estate value is not always clear without experience. A Central Ohio real estate expert will help you make choices regarding location that will be in your best interest. Your agent can help you choose the right Columbus community for your lifestyle and the best lot within the neighborhood. Without a trusted adviser, you may find yourself choosing a lot from a glossy pamphlet in the builder’s sales office. These are marketing materials. While everything on paper may look pretty, green, and level, you don’t really know what you’re getting. An agent experienced in Columbus new construction will ask to see a lot’s specific site plan. This will show you the topography of the lot. Do you want a lot with a steep slope? Do you want your home at the bottom of that slope? Do you want a large drainage ditch in your backyard or a huge utility box right in the middle of your front yard? You get the idea. In some neighborhoods, builders are cramming in houses, resulting in home sites that are less than ideal. Unfortunately, buyers often don’t think of these potential lot issues until they have committed to a contract and it’s too late. 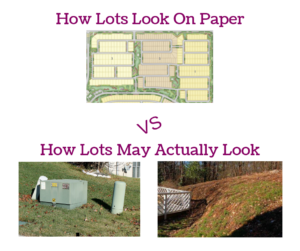 The lot you build on could have a significant impact on the long-term value of your property. If you need to sell down the road, it may be more difficult to sell the home or you may have to reduce the price because of issues with the lot. Even if you don’t plan on selling, lot grading and drainage problems can have a significant impact on the aesthetics and usability of your yard. Additionally, poor drainage can lead to moisture and foundation issues under your home that can not only negatively affect your home’s value, but also your health. An agent working for you will not be swayed by pretty pictures and fancy marketing material, but will look at the facts to help you make the best lot choice possible. One of the biggest benefits of buying new construction in Central Ohio is that you can customize to your wants and needs. As with any home purchase, though, you will likely have to prioritize and compromise. Some features and amenities will be more important than others. Some upgrades are best done during the building process. However, there are some builder upgrades that you should take a pass on for now, because it is a better value to have them done later. Once again, this is something an agent experienced in new construction can help with. Your agent can help you choose the best new home upgrades with the highest return on investment for your Columbus neighborhood. Whether you’re buying a new home or an existing home, there is a lot of paperwork involved. There are confusing documents full of legalese. It can be overwhelming. When you buy a home, any home, you need to have a fiduciary in your corner. Additionally, your agent can recommend an attorney who can add addenda to the contract. This is to guard against problems that could arise. Usually, the standard contract from a builder is written to favor and protect the builder. Your agent and attorney will be working to protect your interests. This is another one that is the same whether you’re buying a new or existing home, but it is absolutely imperative to have a Buyer’s Agent when buying new construction in Central Ohio. In most circumstances, you should not go directly to the builder. They cannot guide you or work in your best interest. For example, a builder will want to sell the home for as high a price as possible. This is not just the builder being greedy on your home sale. The builder wants to keep the price high because then the next home can be sold at a similar price. Comparative home sales are part of what determines home prices. So, the builder can point to your home and expect the next buyer to pay a similar price. While keeping prices at a certain point is extremely important for the builder, your agent may be able to negotiate other concessions such as upgrades. However, markets change. If a builder is selling all homes at full price and not giving away incentives, it’s not realistic to expect your agent to perform a miracle. When homes are in high demand, builders don’t generally need to discount homes. That said, an experienced Buyer’s Agent may be able to find you better deals at certain times of the year even in a seller’s market. During the winter Holiday Season, for instance, builders may offer discounts or incentives because the market is much slower during this time of the year. 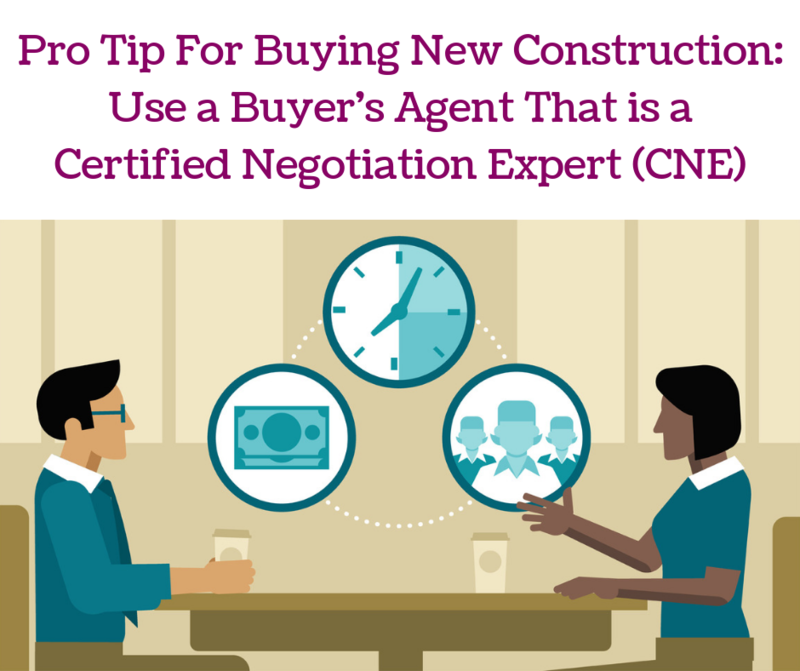 Make sure the Buyer’s Agent you choose to represent you is a Certified Negotiation Expert (CNE). A CNE will have the negotiation skills to get the best possible outcome for you. When you go to a sales office in a neighborhood or make an appointment with a sales agent that works for the builder, it’s important to remember that the builder’s agent does not represent you. They may be friendly, and they may be knowledgeable about floor plans, but they work for the builder. The sales agent will be focused on the best interest of the builder or the company selling the homes. You can and should have your own agent, someone working for you and focused on your best interests. 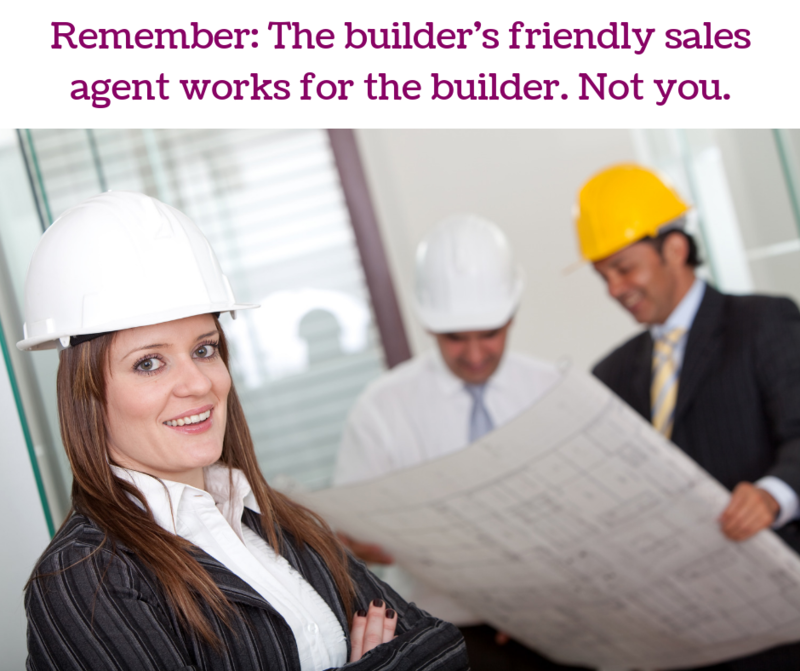 Usually, the builder’s sales agent will be happy to work with your agent. But, even if they aren’t, you need to have your own agent. Anytime you buy a home, new or existing, it is wise to have exclusive buyer representation working hard as your guide and advocate. There are many questions and issues that will come up when buying a new home in Columbus. It makes sense to have someone you trust answering questions and addressing issues. If you go to the builder’s rep with questions or problems, you will likely get very different answers and outcomes, because again, they work for the builder. Anyone who is financially able to buy new construction in Central Ohio can find a builder and purchase a new home. Unfortunately, going this route could put you at a significant disadvantage. If you don’t work in the real estate industry, it may be difficult to determine which builders are reputable. This leaves you vulnerable to being taken advantage of by the builder or their team. It’s just business. When Rita Boswell is your Buyer’s Agent, you can make the key decisions that will get you your dream home. Rita will separate the builder’s marketing and salesmanship from the important facts you need to make the best choices. 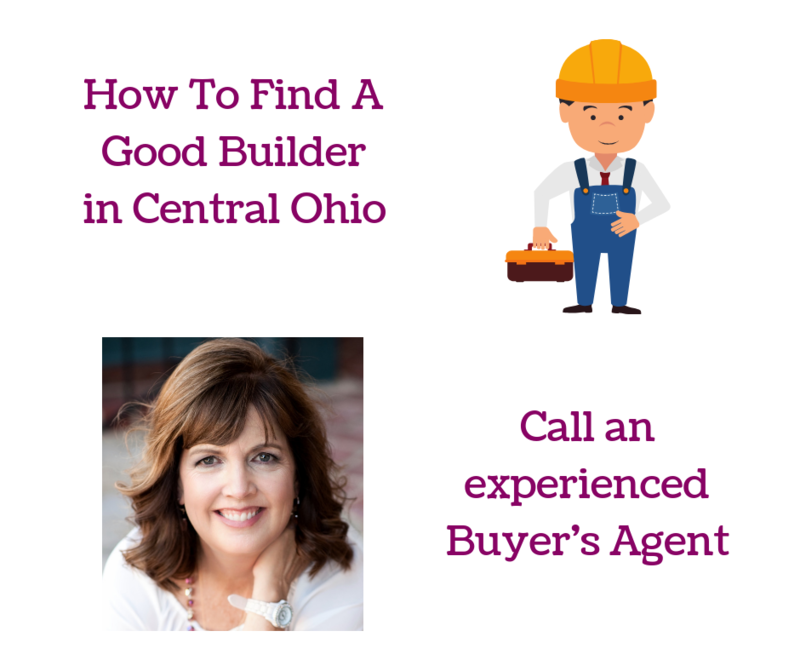 Rita Boswell has the experience to help you find reputable Central Ohio builders. She will help you clearly compare what builders are offering so you can choose what’s best for you. As a Certified Negotiation Expert for Columbus real estate, Rita Boswell is a highly skilled negotiator. Rita will negotiate on your behalf with the builder to get the best possible outcome for you. When buying a new home, final decisions come down to you. But, it makes sense to have an adviser on your side of the negotiating table. If you’re thinking about building a home in Columbus, contact Realtor Rita Boswell at 614-547-3229 to get started.